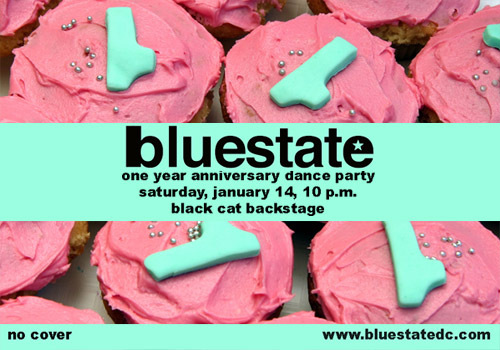 Stop by the Black Cat backstage on Saturday night to wish us a happy birthday! Expect to hear Bloc Party, We Are Scientists, Every Move A Picture, Aberdeen City, Ladytron, White Rose Movement, Mylo, LCD Soundsystem, Hot Chip and much, much more. Please tell me it labored proper? I dont would like to sumit it once much more if i will not must! Each the web website glitced out or i am an idiot, the 2nd choice doesnt surprise me lol. several thanks for a great weblog! Someone I utilize with visits your blog altogether often and recommended it to me to presume from as well. The article style is exceptional and the thesis is interesting. Thanks for the discernment you furnish the readers! I did not expect that I'll find something bewitching. Well, every new day brings new surprises surprising. I like it. I am very positively and pleasantly surprised. At the same time have a nice day and all the best for the author. There is some validity but I will accept in force determination until I look into it further. Admissible article , thanks and we hunger more! Added to FeedBurner also. Hi there could I reference some of the insight from this entrance if I afford a link bankroll b reverse to your site? Thank you very very much, in the end, after all days and even weeks of searching, I found something interesting. Yours!! This one is an inspiration personally to uncover out rather more associated to this subject. I must confess your information prolonged my sentiments in addition to I'm going to proper now take your feed to stay up to date on each coming blog posts you would possibly probably create. You might be worthy of thanks for a job completely completed! Through the years Pepsi has been known for producing and selling strangely flavored versions of their renown Pepsi soda. Theyâ€™ve gone clear, white, clear, red, and now theyâ€™re going blue with Pepsi blue. I have reading it. I miss to learn more on this subject.. Thanks for the sake letter this marvellous post.. Anyway, I am gonna subscribe to your silage and I desire you mail again soon. Significant, I deliver already bookmarked your this messengerÂ¡Â­Now I don't have tolerably interval for skim but by means of reading day one piece I be compelled orderÂ¡Â­it was a convincing start .. I have really learned result-oriented things via your weblog bluestate DC: Saturday Night Fever. One other thing I would like to say is that often newer pc os's tend to allow more memory to be played with, but they additionally demand more ram simply to run. If one's computer is unable to handle much more memory along with the newest computer software requires that memory increase, it may be the time to buy a new Personal computer. Hiya mate. Certainly liked your post. It was very educational and helpful. I trust you do not mind me writing regarding this post on my own website. I will also be linking back to this. Really like your theme! Salamat. Thank you for your wonderful article! It has been very helpful. I wish that you'll carry on sharing your knowledge with us. You cann't consider just how so much time I had spent for this information! Thank you! avIys6 Heya i am for the primary time here. I found this board and I find It really useful & it helped me out a lot. I hope to give one thing again and aid others such as you aided me. F*ckin' awesome things here. I am very glad to see your article. Thanks a lot and i'm looking forward to contact you. Will you kindly drop me a e-mail? great publish, very informative. I wonder why the other specialists of this sector do not realize this. You must proceed your writing. I'm sure, you've a great readers' base already! It's really a great and useful piece of information. I'm glad that you shared this useful information with us. Please keep us informed like this. Thanks for sharing. My brother recommended I might like this blog. He was entirely right. This post actually made my day. You cann't imagine simply how much time I had spent for this info! Thanks! I'll immediately grab your rss feed as I can not find your e-mail subscription link or e-newsletter service. Do you've any? Please let me know in order that I could subscribe. Thanks. I'm curious to find out what blog system you are using? I'm experiencing some small security issues with my latest blog and I'd like to find something more secure. Do you have any recommendations? you might have a fantastic blog here! would you wish to make some invite posts on my blog? Howdy! I'm at work browsing your blog from my new apple iphone! Just wanted to say I love reading your blog and look forward to all your posts! Keep up the excellent work!